Monkeys To Mars Video Slot Guide & Review - Casino Answers! Monkeys To Mars is a 5-reel, 25-line video slot developed by Cryptologic, featuring expanding wilds, scatter wins a re-spin feature and a bonus game. 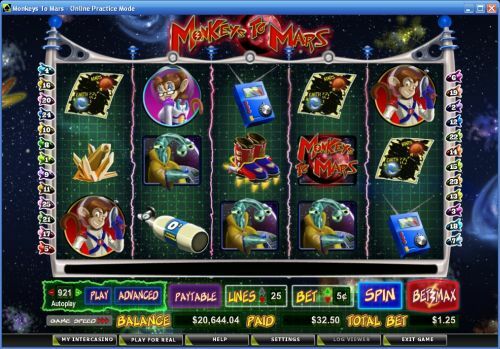 You can play the Monkeys To Mars video slot at [Americans: Unfortunately due to legal restrictions you are unable to play at any of the online casinos this game is at. We recommend you trying playing the unique slots at Win A Day Casino instead.]. Bets on the Monkeys To Mars slot machine are $0.01, $0.02, $0.03, $0.04, $0.05, $0.10, $0.15, $0.20, $0.25, $0.50, $0.75 and every increment of $1 up to $20 per line. You can select from 1-25 paylines per spin on the Monkeys To Mars slot game. The lowest total bet you can make on Monkeys To Mars is a penny per spin up to the highest total bet of $500 per spin. With a betting range like that, it doesn’t matter if you are a low, medium or high stakes player, you will be able to find a bet that will suit your needs. You can set the game speed on Normal, Fast or Very Fast. To play the Monkeys To Mars video slot, either hit the “Bet Max” button or select your bet and then hit the “Spin” button. The highest paying symbol on the Monkeys To Mars online slot is the Monkeys To Mars symbol. 5 of a Kind on a selected payline will pay out 2000 coins. 5 Male Monkey symbols will pay out another high payout of 1000 coins. The Launch Button is the wild symbol on the Monkeys To Mars video slot. It is an expanding wild so whenever it substitutes in a winning combination, all of the symbols on the reel will become wild symbols. It only appears on reels 2, 3, 4 and 5. You can win lots of cash with the expanding wild when you play the Monkeys To Mars video slot at [Americans: Unfortunately due to legal restrictions you are unable to play at any of the online casinos this game is at. We recommend you trying playing the unique slots at Win A Day Casino instead.]! The Rocket Re-Spin feature is triggered at random and occurs on reels 2, 3 and 4 only. During a reel re-spin, all of the Purple Crystal symbols on that reel will become Launch Button symbols. The initiating game outcome is analyzed for payouts, then 1, 2 and/or 3 or the reels will re-spin. The initiating game outcome is then added to the re-spin feature outcome. The Asteroid bonus game feature cannot be triggered during Rocket Re-Spins. Payouts are displayed on the Paytable. Payline wins are multiplied by the bet per line. Highest win amount is paid on each selected payline. Scatter wins are multiplied by the total bet and added to payline wins. Winning combinations pay from left to right, except for scatter wins. The Launch Button appears on reels 2-5 only and substitutes for all symbols except for the Alien and Monkeys To Mars symbol. The Alien appears on reel 2, 3 and 4 only. You can use the Monkeys To Mars autoplay mode by selecting up to 999 autoplay spins and hitting the “Play” button. You can also hit the “Advanced” button to access its advanced features. You will be able to select stop settings including cumulative win or loss of up to $5,000, single win of up to $5,000 or upon completion of free games. You can stop the autoplay mode on the Monkeys To Mars video slot at any time. Monkeys To Mars has a fun combination of two themes – a sci-fi theme combined with a monkey theme. It’s sure to be a winner to people who like monkeys (and who doesn’t?) and perhaps fans of the sci-fi genre as well. It’s also got a lot of special features like the bonus game, expanding wilds and re-spin feature. The main negative we see in it is its low top payout of 2,000 coins. Fortunately, the positives far outweigh the negatives, even if there is no weight in space. You can blast off with the Monkeys To Mars slot game when you sign up and make a deposit at [Americans: Unfortunately due to legal restrictions you are unable to play at any of the online casinos this game is at. We recommend you trying playing the unique slots at Win A Day Casino instead.]! Can players from the USA play the Monkeys To Mars video slot for real money? Unfortunately, American players are unable to play the Monkeys To Mars online slot game for real money at this time. For a great selection of USA-friendly slots you can play, please check out our Rival slots list or simply play them now at Bovada! Can I play an Instant Play version of Monkeys To Mars for free? You can play an Instant Play version of the Monkeys To Mars video slot at Cryptologic online casinos such as [Americans: Unfortunately due to legal restrictions you are unable to play at any of the online casinos this game is at. We recommend you trying playing the unique slots at Win A Day Casino instead.] for real money only. If you experience any issues with the Instant Play software, make sure you have the latest version of Adobe Flash Player installed on your computer. 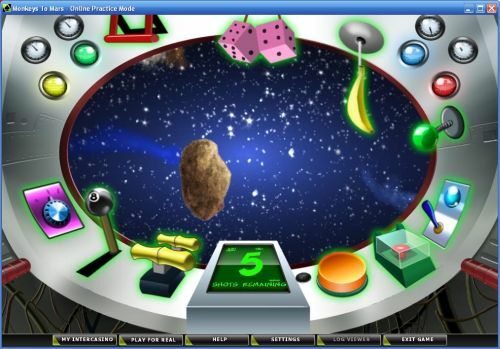 You can find lots of exciting slot machines and video slots with all types of different sci-fi themes in our list of Sci-Fi slot games.